My birthday was this past week and my sweetie took me out for a lovely dinner at Gather Restaurant in Berkeley. Gather specializes in local and organic Californian Cuisine that can satisfy everyone, from vegan to carnivore. With such a commitment to sustainability you might think they would be a little precious about their food (tiny servings, weird combinations) but Gather does sustainable gourmet that delights your taste buds and leaves you with a full belly and a smile. Andrew and I split an appetizer, entree, salad, and dessert and It was more than enough food for us both. We started off with mushroom bruschetta which was surprisingly rich and extreamly flavorful. 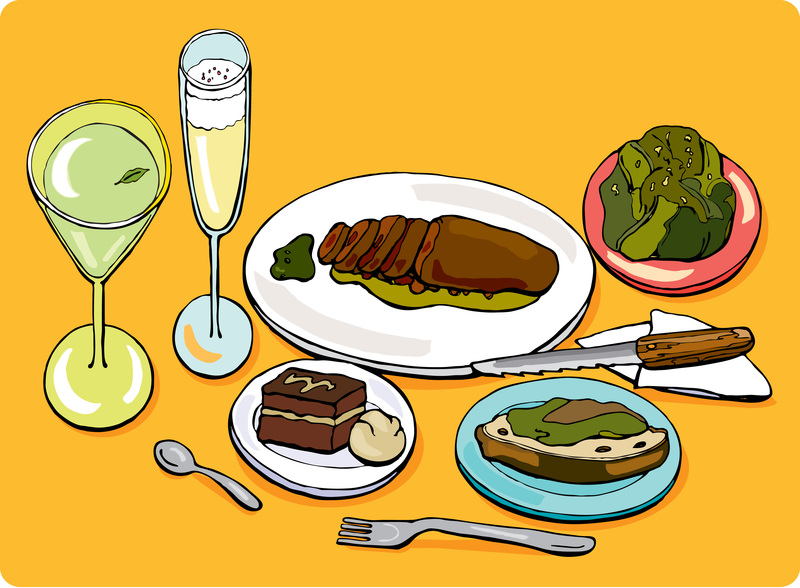 For the main course we ordered roasted duck with pesto on a bed of duck sausage and pureed artichoke. The duck was so tender and the flavors so complex that I had to close my eyes to concentrate on the taste. The kale salad with roasted carrots, capers, and almonds was a perfect complement to the duck. For dessert we had hazelnut chocolate cake with cashew-cinnamon “ice cream.” The meal was truly amazing and I enjoyed every mouthwatering bite. Along with the amazing dinner we had a few fancy cocktails. Delicious dinner, yummy drinks and great company: what more could a girl want on her birthday? Dinner at Gather was real treat. If your looking for a nice evening out in the Bay Area, I recommend you give it a try! This cake rocks my socks. 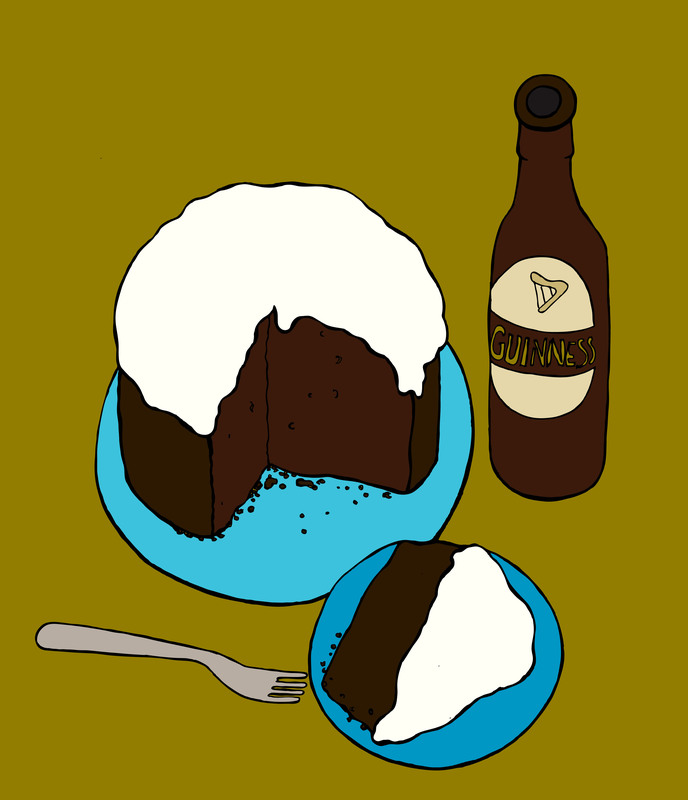 I found the recipe for Guinness Chocolate Cake over at Design*Sponge when I was searching for a cake to make for my sweetie’s birthday. The oddity of having Guinness as a main ingredient sold me on this particular recipe, but we were in for a surprise. This cake is AMAZING! It is perfectly moist and has a deep chocolatey flavor. Not to mention, the icing is basically a cheese cake. Needless to say, this cake is not for the faint of heart. I made this cake again when I was home for the holidays and it went over well with the whole family. My mom was a little dubious when I cracked a can of Guinness while mixing the batter, but she was definitely won over in the end. This cake has firmly cemented itself as my all time favorite dessert. For those of you who find making a cake from scratch intimidating, I assure you this is (fairly) painless. You’re cooking with Guinness! Just crack one open for yourself after you give one to the cake. I made this in my sparsely stocked kitchen and had to improvise on several steps. For one, I don’t have a mixer so I had to put a little extra love/elbow grease into combining the ingredients. If you don’t have a sifter, you can use two spoons to toss the flour (like a salad) in order to loosen and aerate it. To whip the cream, two forks and some love will do the trick. You can tag team this effort, whipping cream by hand is a bit of a workout. (But seriously, this cake is rich. You may as well get a little exercise before you indulge.) My point is, you can do it! It will be well worth your effort. Enjoy! Jump on over to Design*Sponge for the full recipe.